IMMOKALEE, FL — NBA Hall of Famer Ralph Sampson stopped by Immokalee High School on Oct 16 to talk with students who filled nearly all 600 seats at the Immokalee High School Auditorium. Source: Naples Herald. The NBA began courting Sampson during his high school years and it didn’t stop throughout college. He has come to be known by many as the most heavily recruited college and professional prospect of his generation but he knew what he wanted…an education. He graduated from the University of Virginia with three National Player of the Year awards and a bachelor’s degree in communications under his belt. But what the legend really wants students to understand is what makes them happy, whatever makes them happy is achievable. Ralph Sampson is a retired NBA basketball player. A 7-foot-4 phenom, three-time College Player of the Year, and No. 1 pick in the 1983 NBA Draft, Sampson brought heavy expectations with him to the NBA. The NBA Rookie of the Year averaged 20.7 points and 10.9 rebounds for his first three seasons with the Houston Rockets before injuries began to take their toll. Three knee surgeries later he retired a four-time All-Star whose career highlight ended up being a buzzer-beating shot to dethrone the Los Angeles Lakers as Western Conference champions, derailing their hopes for coveted back-to-back NBA titles and sending the Rockets to their second NBA Finals in the team’s history. Sports Speakers 360 is a booking agent for pro athletes. 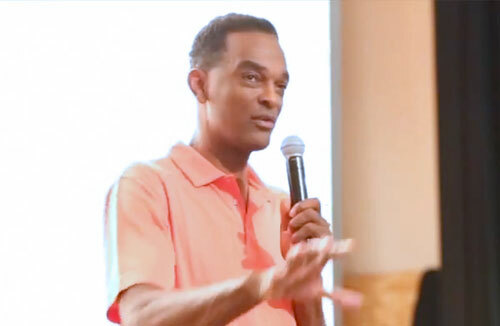 If you would like to book Ralph Sampson for a speaking engagement, appearance or endorsement, contact Ralph Sampson’s booking agent for fees at 1.855.303.5450.